World Vegetarian Day, the day intends to raise awareness about the benefits of having a vegetarian lifestyle. Studies show that vegetarians are less prone to heart disease, diabetes, obesity, cancer, and other health problems. Also they maintain a overall good health condition. 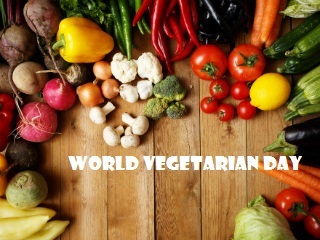 World Vegetarian Day was first recognized by the North American Vegetarian Society in 1977 in order to promote the vegetarian lifestyle among non-vegetarians. After that it was adopted by the International Vegetarian Union and by years it gained popularity among the public. Studies show that vegetarians consume more fiber and anti-oxidants which is well known for their ability to fight cancer.